The Indian defence minister will also co-chair the 13th Meeting of the India–Russia Inter-Governmental Commission on Military Technical Cooperation (IRIGC-MTC) with his Russian counterpart Sergey Shoigu. India’s Defence Minister A K Antony arrives in Moscow today for a four day Russia visit, in which he will be present for the commissioning of the INS Vikramaditya at the Sevmash shipyard in Severodvinsk. He will also co-chair the 13th Meeting of the India–Russia Inter-Governmental Commission on Military Technical Cooperation (IRIGC-MTC) with his Russian counterpart Sergey Shoigu. The commissioning ceremony will take place at Sevmash Shipyard tomorrow and the IRIGC-MTC meeting will take place in Moscow on Monday. 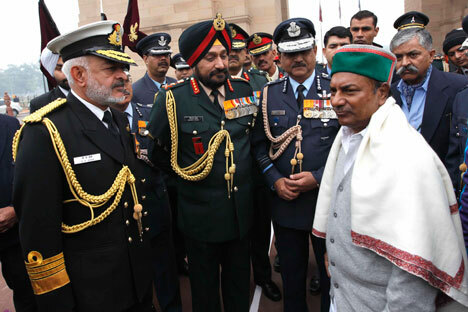 Antony is being accompanied by high level delegations for both the events, the Indian defence ministry said in a press note. The Chief of Naval Staff Admiral D K Joshi and Defence Secretary R K Mathur will be among those present at the commissioning of INS Vikramaditya. Russian Deputy Prime Minister Dmitry Rogozin will join Defence Minister Shoigu for the ceremony. At the IRIGC-MTC meeting a broad spectrum of issues related to on-going and proposed defence projects and defence cooperation between the two countries will be discussed, the defence ministry said, adding that the two sides will also exchange views on regional and global issues of concern to both the countries. Several media reports have indicated that Indian plans to lease a second nuclear submarine from Russia will be high on the agenda. From the Russian side, displeasure over the Indian tender system will be taken up, according to informed sources. “Deals have to be made on intergovernmental basis,” Last month, Russia’s ambassador to India Alexander Kadakin told India’s Rajya Sabha TV. “Tenders are often sly and crafted. You can easily see it in that notorious helicopter deal, about which we read on front pages every morning. That is why we are not exactly in favour of tenders. I wonder through which tender would you lease a nuclear submarine, or produce the best cruise missile in the world like Brahmos,” the ambassador asked. Russia and India have come to an understanding that joint production is the way ahead for defence ties between the countries. IRIGC-MTC was established in 2000 with a view to strengthen defence cooperation between the two countries, the Indian defence ministry said, adding that it has been meeting annually, alternately in Russia and India at the level of the defence ministers of the two countries, to review and discuss matters relating to bilateral defence cooperation between the two countries.